Valentine's Day is tomorrow. I don't know if Taylor and I will be able to do anything or not since he has a night class, but hopefully we will find a time to do something soon. If nothing else, yesterday was really nice. We explored a new area, went to a coffee shop we'd never been to, and played disc golf at a park we discovered near the coffee shop. It was a beautiful day and we were able to spend it together. 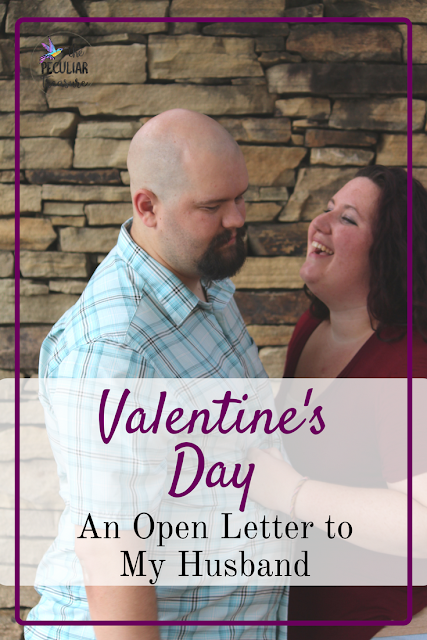 Regardless of what our Valentine's day ends up looking like, I wanted to take the time to write an open letter to my wonderful husband. Not only do I just want to brag about my husband, but I hope that this will inspire any of you who are married to recognize the good in your husband and thank him for it. I also hope this will inspire those of you who are single to wait for a man who treats you well- who, despite his flaws, is always there. Happy Valentine's Day, Handsome. I am so thankful I get to call you mine. I'm thankful for your patience. I'm thankful that you rarely get angry when I'm dramatic, OCD, or paranoid. I'm thankful that you want to tell me about your day, and you want to share what's been on your mind. I may get a little bit impatient when we talk about politics for long periods of time, but I am still grateful that you share your mind with me. I'm thankful for your heart for God. You are more intellectual and practical than I am, so sometimes I struggle to understand you, but I love the balance that creates for us. I love that you have a beautiful, trusting heart for our Savior and I love your desire to reach the un-reached, and to teach people to think through what they believe and why they believe it. I appreciate how hard you've been working during this season of our lives. You are pursuing your dreams while still working constantly to make sure we can pay the bills. And I love that you care that I like where I work. I love that you are happy for me to work where I am happy instead of wanting me to step into the corporate world. I'm sure it would be easier on you if I did, but you've never asked that of me or expected that of me. Thank you. Thank you for treating me with respect and being understanding of my flaws, weaknesses, and quirky character traits. Thank you for admitting when you're wrong, for apologizing when you've hurt my feelings, and forgiving me quickly when I've hurt you. Thank you for seeing my beauty despite my weight and for loving me as an attractive wife. I don't always feel that way, but you let me know that I am still attractive to you. Thank you for sticking with me through my depression, anxiety, and OCD. I know it hasn't been easy for you, but you've been a trooper. Thank you for always forgiving me when I am bossy and naggy. I know that's one of my worst, most-common sins and I am so thankful you forgive and let it go so quickly. I'm trying to do better. And thank you for reminding me that God loves me- that I am covered in grace, that He understands me even when I feel like He doesn't, and that my failures never change His love for me. I love you so much, Taylor, and I hope you and I have years and years of Valentine's Days left with each other. I love walking through life with you as my husband. I'm glad I'm with you! This is such a sweet idea. Some years are a time for big gestures, and some years are a time for saying, "Thank you for all of the little things that you do that I don't always have time to acknowledge." This is so sweet! I hope I meet a man half as amazing as he sounds! I hope you both have a fantastic Valentine's Day (even if you don't get to go all out due to his night class). Your love is inspiring. Thank you for sharing it. I love this. Sometimes we forget to tell the people we love the most how wonderful they are and how much we love them. What a beautiful tribute. Such a sweet and thoughtful letter. You guys sound like you have an amazing relationship, and I love how you appreciate each other. Hope you get to spend a little time together today. such a sweet letter. You are very blessed to have each other. This is super cute and so sweet! I love this!! So beautiful! 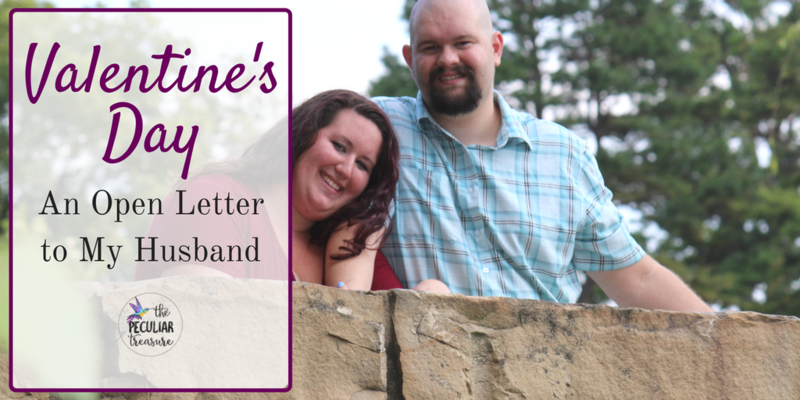 I love this post and it's such a good reminder to appreciate all our husbands do. :) Mine is at work tonight but we celebrated a few days ago!